We weren't very inspired when it came to looking for storage for the kids' rooms, and needed to find something that didn't have to be kept on the floor or shelves. This large bag can be hung from a hook, chair or bedknob, and can be used for laundry, books or those little toys that get lost in the bottom of bigger toy boxes. 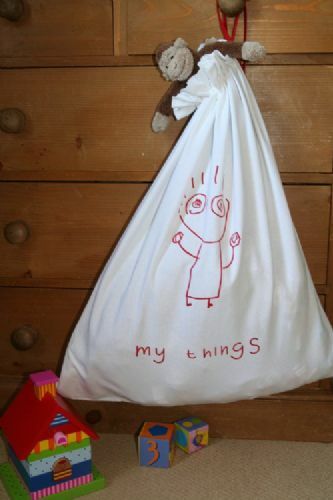 Ours have even been used as overnight bags for visits to granny. Designed by our very own children, the adorable image is handprinted in red on hard wearing machine-washable canvas with matching drawstring hanging loops. Overall, the bag measures 70cm x 50cm.